The field of next-generation sequencing (NGS) has experienced explosive growth over the past several years and shows no sign of slowing down in the near future. The field of next-generation sequencing (NGS) has experienced explosive growth over the past several years and shows no sign of slowing down in the near future. Dramatically lowered costs have expanded NGS’ reach beyond that of the human genome into nearly every corner of biological research including cancer biology, metagenomics, and plant biology, to name just a few. In the past 10 years, the cost of sequencing a human genome has dropped precipitously from $100M to under $4K and is anxiously anticipated to dip below the $1K mark in the next year or two. Increasing capabilities, easier-to-use instruments, and plummeting costs are attracting more and more genomics researchers who may have previously lacked funding or technical expertise to adopt NGS strategies. However, keeping up with the latest advancements and choosing a platform can be a challenge. There are thousands of journal articles citing NGS technologies, with over 3,000 alone for Illumina. For those new to NGS, navigating through the various platform options can be a daunting task. The research community has obviously benefited from the competitive environment among the NGS vendors as they’ve driven down the cost of sequencing. Fierce competition continues to push the current high-throughput platforms to generate more data for less money. For example, Illumina’s HiSeq® machine can generate 600 Gb—that’s enough data to sequence six whole human genomes, 60 human exomes, or 200+ RNA samples in a single run. Lowering the “per Gb cost” while keeping error rates to under 1% are the key metrics that have been driving this industry. The most competitive instruments today have lowered the cost per Gb by becoming massively parallel, with as many as three billion sequences generated concurrently. Output has also improved by increasing the read lengths of each run. While Sanger sequencing can generate reads of 1 kb or more, the high-throughput instruments of the past started out with reads as short as 25 bases. High-throughput NGS machines have steadily improved over the past few years, with read lengths reaching 150 bases. While extremely successful, achieving the goals of “more data for less money” has not come without sacrifices. High-throughput sequencing machines are expensive and require long run times. Instruments with the highest output (and the lowest cost per Gb) are priced in the range of $600K to $700K. While the cost per Gb is quite competitive, the minimum run cost for these machines is still several thousand dollars. And the longer read lengths have come at the expense of substantially longer run times, which now generally range from 6 to 11 days. For researchers with large projects and big budgets, long runtimes and high minimum run costs aren’t such an issue. They’ve got enough samples to “feed the machine.” Projects with flexible timelines could possibly spare the additional time required to pool samples with other researchers to create a complete run, but researchers with smaller budgets may not have the capital to purchase an instrument of their own. For those with time-sensitive projects, a quick turnaround is high priority. For example, researchers testing the quality of a library or new preparation methods with multiple iterations need results quickly. Clinicians dealing with patient samples (where sequencing results may be necessary for diagnoses or choosing treatment options) require results even faster. Major platform companies have recognized the need for faster, maximum throughput sequencing with minimum costs and have responded to these market trends. They are focusing on smaller, less expensive desktop instruments with faster run times and lower run costs. The first to respond was 454 Life Sciences with its GS Jr™ system in early 2010. With this machine, capital costs are reduced to $125K and the running cost are reduced to $1K. While each run only generates 35 Mb of data (which is just 0.035 Gb compared to the 600 Gb generated by the HiSeq), it does so over a period of just 10 hours. Life Technologies followed in late 2010 with the launch of its Personal Genome Machine or PGM™, based on the Ion Torrent platform. Depending on the chip format, this $50K machine can generate between 10 Mb and 1 Gb in 2 hours at a cost per run range of $349 to $749. 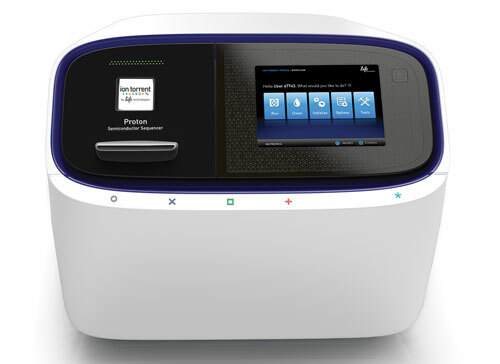 New desktop sequencers from Life Technologies (Ion Proton, above) and Illumina (MiSeq, below) are making next-generation sequencing accessible to more researchers. 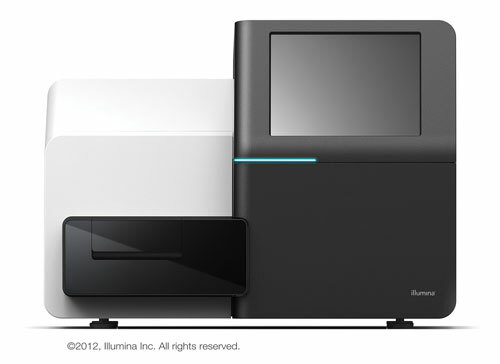 Illumina followed suit with the introduction of its desktop sequencer, the MiSeq®. With a runtime of up to 27 hours, the $125K MiSeq is not as quick as the PGM, but substantially faster than its own HiSeq high-throughput machine. The MiSeq boasts the greatest output of any of the desktop machines with up to 4 Gb of sequence per run for $750. The lower, more budget-friendly pricing of these new desktop instruments is introducing next-generation sequencing to a whole new group of researchers. The smaller, less expensive outputs are enabling these researchers to focus on smaller genomes (e.g., bacterial and viral) or on targeted sets of genes (e.g., those implicated in cancer). While everyone will benefit from the rapid run times, this will undoubtedly be a critical feature as NGS moves into the clinic, where patient samples need to move from DNA to data as quickly as possible. While high-throughput instruments are still generating the majority of the world’s sequencing output, the new desktop machines are where the market is moving to and where the vendors are placing their bets. Life Technologies has stated that its primary focus will shift toward the Ion Torrent technology, explicitly at the expense of its SOLiD® platform. Toward that end, the PGM instrument will be joined by the Ion Proton™ later this year. At $149K, it will be more expensive than the PGM, but is projected to start with outputs in the 10 Gb range, growing to 100 Gb by early 2013. Illumina plans to improve the output of the MiSeq, with read lengths expected to reach the 400 base range. In order to expand the utility of Illumina’s high-throughput HiSeq machine, they are giving it some “MiSeq-like” capabilities via a $50K “fast-mode” upgrade, which will allow it to generate 120 Gb in 27 hours. Since the MiSeq and the HiSeq share similar chemistries, advances on one platform will likely make their way to the other. One thing’s for certain, next-generation sequencing isn’t going away anytime soon. As NGS instruments improve, they are becoming the technology of choice for ever more areas of research. And as researchers continue to push them to their limits, vendors will continue to respond by offering instruments and consumables that perform better and faster with pricing competitive enough to fit researchers’ budgets. Shawn C. Baker, Ph.D. (sbaker@blueseq.com), is the CSO of BlueSEQ, an independent guide for researchers outsourcing their next-generation sequencing projects.